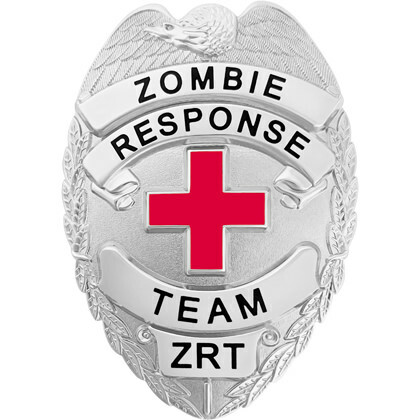 The Zombie Response Team Badge is your go-to armor, officially certifying you as a apocalypse-ending team member you know you can be! Measures 3.125″ x 2.25″, with a zombie-repelling gold or silver plated finish applied over a nickel base, you can be sure that when the world comes to an end, your badge will stand the test of time. Equipped with a heavy duty pin and clasp attachment, to secure your badge, you can rest easy knowing the beings from out of this world will recognize you from miles away. Grab yours today, or be eaten alive. Add the optional leather badge holder to wear around your neck!